This is a game that is frequently played during the New Year. Pieces of paper cut in the shape of eyebrows, eyes, noses, mouths and ears are to be matched with a drawing of an outline of a lady’s face, known as the homely lady (otafuku). To play, one person is blindfolded and he/she creates a face by placing the eyes, nose and other pieces on the outline. Because one proceeds by instinct, the comical features of the completed picture cause others to burst out in jovial laughter. Shichifukujin are the seven gods that bring good luck. 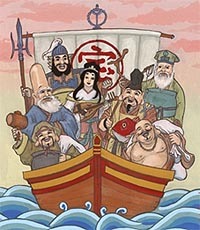 They are representative of gods and holy beings in Buddhism, Shintoism and Taoism and are often portrayed as riding on a treasure ship. Shichifukujin became widely known in the Muromachi Period (1333 – 1573). Nowadays, at temples and shrines with Shichifukujin beliefs, people pray for long life and family well-being. Merchants display pictures of Shichifukujin in the hope that it will bring business success. Even in the midst of the greenery announcing springtime, willows send forth their sprouts before all others and announce the coming of spring. This is why they have been enjoyed by the Japanese people since ancient times and are often included in poems. Perhaps because they are so loved and have been planted everywhere throughout Japan, there are many proverbs using the concept of willows. There are more than 90 different kinds of willows, with the weeping willow being the most common. The willows along the streets of Ginza, Tokyo are so famous that they are sung about in popular old songs. 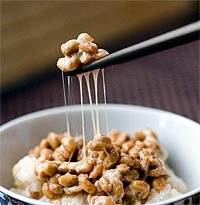 Natto is made from soybeans by putting them into a tube made out of straw to allow the fungus to propagate. The string on the straw tube is tightened in order to allow the soybeans to ferment and become sticky. A dish peculiar to Japan, it is a popular breakfast item eaten mainly in the Eastern part of the Japan Archipelago; it is not really liked in the Western part. However, the number of people who eat it is gradually increasing even in the Western part of the country because natto has gained popularity as healthy food for a balanced diet. 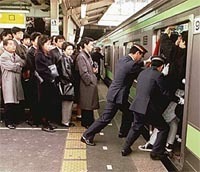 Commuter trains in large Japanese cities are notorious around the world for being terribly crowded. To reduce congestion, four-track lines have been laid, and each train carriage has been fitted with more doors. However, these changes have not improved the situation. Overpopulation, which is a problem most acute in Tokyo, combined with high land prices and excessive crowding during commuter peak hours, have prompted serious discussion on relocating the capital city of Japan. The knack of riding the trains in Tokyo is surely to avoid the peak hours. 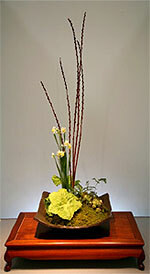 Flower arrangement is a traditional Japanese art that has flourished since the sixteenth century. Its origin is said to date from the sixth century when Buddhist priests offered up flowers to Buddha. Its fundamental concept is to express the three elements of heaven, earth and mankind in a balanced composition, using natural flowers. The general style is to fill a wide-mouthed simple vase with water and arrange the flowers on a metallic plate with a lot of thick needles pointing upwards. Natural beauty and feelings are expressed by using scissors to adjust the length of the stems and to modify the shape of the leaves ,and by using the hands to add curvature. Today, avant-garde flower arrangement that does not even use plants is one genre of the art. An annual climbing plant originally produced in Asia, morning glory blooms from midsummer to early fall. It was brought to Japan for medicinal purposes by an envoy to China some time in the 9th century. In keeping with the meaning of its name in Japanese, "morning face," it blooms in the morning and the blossoms close up immediately. 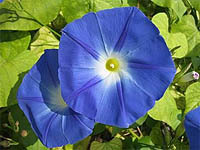 The cultivation of morning glory flourished in the Edo Period (1603 – 1867) and many varieties were developed. In the hot, humid Japanese summer, morning glory blooming in the cool morning air softens people’s hearts. From July 6th to 8th, there is a special morning market held in the Shitaya district of Tokyo where pots of morning glory are sold. Vending machines are everywhere throughout Japan. Products in them range widely, from alcoholic drinks and cigarettes to flowers and underwear. 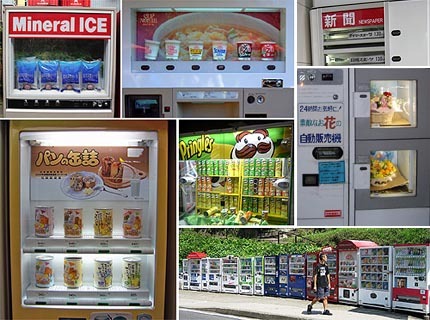 Vending machines are probably more widespread in Japan than anywhere else in the world. Even when stores are closed, items can be purchased from vending machines, so they are convenient for consumers; even for sellers there are almost no personnel or store expenses. However, the biggest reason why vending machines have proliferated in Japan is “safety”. Without public peace and order, vending machines would probably have been vandalized or stolen before becoming so widespread. Thus, the proliferation of vending machines tells us partly about how the Japanese people presently live their lives and partly about the secrets of the development of the Japanese economy. 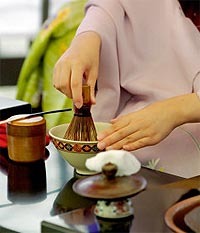 Sado, also called Chado or Cha-no-yu, is the traditional etiquette of preparing and drinking tea when one has guests. In Sado, it is special powdered tea, different from ordinary Japanese tea, that is used. The powdered tea is placed into a tea cup, followed by hot water.The tea is then whipped with a bamboo whisk till it foams and ready to be drunk. In the sixteenth century, SEN NO RIKYU elevated Sado to a level of perfection by incorporating simple aesthetic values known as Wabi (subtle taste) and Sabi (elegant simplicity) and the concept of Ichigo-ichie (in a lifetime there is but one encounter). To heighten the significance of the encounter, the host demonstrates his/her sincerity by adding personal touches such as a hanging scroll and flowers to put in the alcove. By paying attention to such details, guests can experience the host’s warm hospitality and be filled with gratitude. 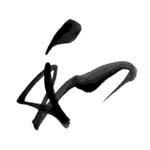 One of the most important words for understanding the spirit of the Japanese people is Wa (harmony). Shotoku Taishi, who in 604 A.D. authored Japan’s first constitution-the Seventeen-Article Constitution-wrote in Article 1 that “Harmony is to be valued”. Together with the absolute authority of the Imperial Household and fair and unbiased government, harmony is the idea providing the constitution's nucleus. The document was based on Confucian and Buddhist fundamentals, and it later formed the intellectual foundation for Japan's national laws. In those days, rice agriculture was the basis of the nation's economy, and harmony was considered the most important element for the very important cooperative work required to cultivate and harvest rice. With this historical and cultural background, the Japanese people feel that harmony is more important than self-assertion, argument or confrontation. 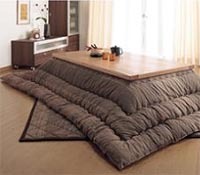 Kotatsu are heating devices that fit the Japanese “lifestyle of sitting on flooring rush mats". A low wooden table is covered with a thick bedding and a ceramic container with burning charcoal is placed underneath. This makes it warm, so one's body warms up when sitting covered to the waist with the thick bedding. Today, it is not done with charcoal but with an electric heater beneath the table. Similar to usage of the Western fireplace, the family in Japan relaxes around the kotatsu in winter. "The train came out of the long tunnel into the snow country.” That is the famous opening of Nobel Prize-winning novelist KAWABATA Yasunari’s masterpiece “Snow Country”. This phrase accurately indicates a geographical feature of Japan. 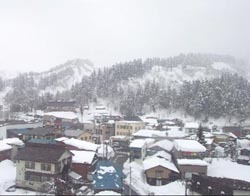 In winter, a chilly seasonal wind blows from Siberia, striking the mountain range that runs through the central part of the main island (Honshu) from the northwest to the southwest and causing heavy snowfall on the Sea of Japan side. There is not much snowfall on the Pacific Ocean side of the mountain range. Thus, when one comes out of the tunnel from the Pacific Ocean side to the Sea of Japan side, the snow country, with snow piled high, dramatically appears. The term Snow Country therefore indicates the regions on the Sea of Japan side of Honshu, the northeast area and all of Hokkaido.